Hello all, happy hump day!! A quick and easy card today. 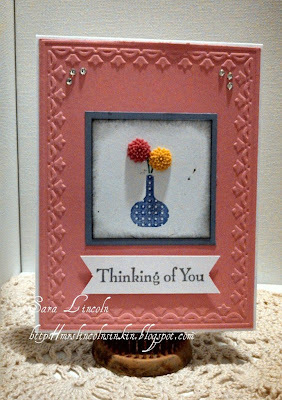 You can never have enough "Thinking of You" cards around. They are a go to when a friend/family member is having a rough time, someone is recovering from an illness or just a way to let someone know that they were on your mind. Today's card is an average card measuring at 4 1/4" x 5 1/2". I used the Petal Boarder Embossing Folder (i love this folder) and the new In-Color Adornments that i just received in the mail the other day! They are so awesome!! Today's featured stamp set that i want to share is the Bright Blossoms set. This set can be used with buttons, jewels... pretty much anything you want to accent the flowers like i did above. This is another one of my new sets but i can already tell that it is going to be one of my many favorites!! Whisper White, Tulip Boarder Embossing Folder, Regal Rose Card Stock, Big Shot, Wisteria Wonder Card Stock, Wisteria Wonder Ink, Bright Blossoms Stamp Set, Lovely Lilac Marker (retired), Glorious Green Marker (retired), In-Color Adornments, Basic Black Ink, Sponges, Snail, You are Loved Stamp Set, Jewels, Dinensionals.